WR Geremy David has the measureables. And, he is excited about his chances. 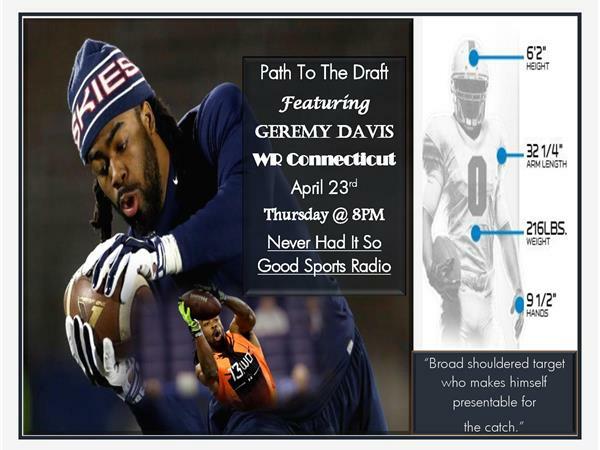 We will discuss his path to the draft on the show tonight. He has come through the halls and tutorial of Fellowship Sports and Ronnie Battle Jr. And, we are excited to promote Geremy for making some awesome decisions in life. Strengths: Geremy Davis is a big receiver who does a fine job of positioning himself for the catch. Davis does a nice job of winning jump balls and has an aggressive side that allows him to muscle it away from defensive backs. Davis isn’t the most polished blocker but can hold his own and makes an honest effort. Davis makes most of his plays on the outside but has shown he’s comfortable going across the middle. Davis has good instincts and positions his body well to make impressive plays near the sidelines. Geremy Davis works hard and comes with zero baggage. Projection: Geremy Davis is a receiver who will be selected in the later rounds but his height and flashes of physicality are intriguing. Davis has a hard time creating separation, which won’t change in the NFL, but he could fight for a roster spot and be an OK backup receiver on a team lacking depth.